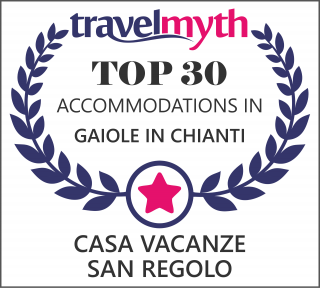 Welcome to Casa Vacanze San Regolo, a lovely, enchanted place, deep in the green of nature where you will enjoy and relax youself. A place where spend a time that you’ll never forget. Cottages are situated in the green countryside of Siena. Our facilities have been designed and furnished in order to make your stay as comfortable as possible in the silence of nature, in the shadow of the beautiful castle of Brolio. The surrounding countryside is not only enjoyable thanks to the covered veranda and the private garden of each house, but especially from the pool that overlooks the vineyards and the Mount Amiata. And if nature is not enough, you can easily visit a short ride the beautiful city of Siena, where the medieval atmosphere revived today. In the section "prices and services" you will find listed all the possibilities offered by the property, from satellite TV, to BBQ, from the air conditioning, internet. Our guests also have the opportunity to take advantage of a garden to enjoy genuine products of the earth, grown without the use of additives or pesticides. San Regolo Casa Vacanze rises on Chianti’ hills (Siena), next to Brolio Castle, that was built during the Medieval Period. It became part of Ricasoli’ family properties after a land exchange in late 1141. This Caste soon became the scene of the conflicts of its time, due to its strategically position just between the two main cities of Florence and Siena. Due to several rebuildings, today the Castle bears the marks of different eras: from the medieval fortified bastions to the Romanic and Gothic elements. But also the peculiar nineteenth century Tuscan architecture. Case Vacanze San Regolo, thanks to its particular location surrounded by the countryside, allows guests to enjoy nature and relax themselves. At the same time you will also easily reach beautiful Art cities as Siena, Florence and Arezzo.